I love good, wholesome supplements that have great benefits for people. I take antioxidants and vitamins and certain other supplements due to my specific needs and my body's requirements. One that I just started taking recently is this Collagen+C pomegranate liquid plus the Pomegranate from the seed capsules. These are pretty neat. Collagen has many health benefits, especially for connective tissue, joints and bones, but also it is amazing for hair skin and nails. When I started taking collagen, I definitely could tell a difference because my nails grew 2x as quick as normal, and so did my hair! I have always had pretty decent skin so I was unable to tell an immediate difference in my skin. Pomegranate's legendary health benefits date back over 5,000 years. Scientific studies show pomegranate extract as one of the most active and superior antioxidants. These two products together work like a charm. The Collagen+C Pomegranate Liquid combines the antioxidant benefits of pomegranate with the beauty benefits of NeoCell collagen. The daily dose is only a tablespoon, which you can drink directly, or mix with water or juice, or even herbal tea. The Pomegranate from the Seed capsules are made from the juice extracted from the seeds. The seeds contain the highest level of antioxidant capacity. A serving is 2 capsules, and taking it daily offers up 1,000 mg of the pomegranate extract. 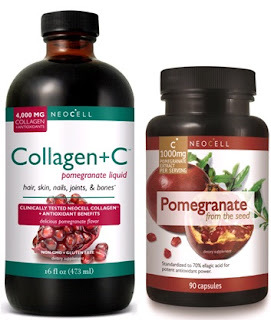 NeoCell products are sold at many health food stores nationwide, including Whole foods Market, GNC, Walgreens, CVS etc.